Statement of Faith, by Rev. 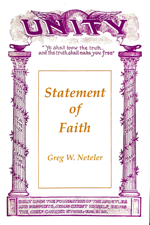 Greg W. Neteler, is available from Unity Church Universal, 913 Tracy Avenue, Kansas City, MO. 64106-3148. This 116-page book contains an introduction and history of Unity's Statement of Faith, helpful hints on how to approach the Statement of Faith, commentary on each of the 32 statements, including a Meditation in the Silence for each and numerous photographs and sidebars that provide additional details for the Truth Student. This is an excellent resource for those who are studying Unity's classic teachings.